When I planned to spend 3+ months in Vancouver, I wasn’t sure what to expect. What was the food scene like? What was this slice of Canada known for? Would I find good markets? What about great ice cream? I’d heard the Asian cuisine here was off the charts…were some epic sushi nights in my future? Here’s the good news: the answers were yes, yes, and yes. Like any city, you can find mediocre food and not every restaurant we tried was a hidden gem. But over my three months in the city, my list of favorites just kept growing. Epic sushi nights? Check. Great maple syrup? Check. Ice cream sandwiches the size of my head? Double check. If you’re a foodie off to visit Vancouver, here’s the results of all that research on what to eat and drink in the city. For the best sushi in Vancouver, you’ll need to make an unusual detour—to a strip mall in the middle of the suburbs. Yep. You heard me right. A strip mall. Next to a fast-food chain restaurant. The restaurant interior is nothing special and the location is rather out of the way, but here you’ll find sushi so delicate that it melts on your tongue and brings you back for more again and again. Bring a friend and order a selection or just ask the chef for his recommendations. The servings aren’t as fancy as the top recommended places in town, but the sushi itself is far superior. Fun fact: Over 40% of Vancouver residents are Asian—and the food scene reflects that. If you want to try Asian cuisine in North America, this is a good place to do it. Way across town on charming, waterfront Granville Island, this cute little organic bakery features excellent breads and, even better, homemade ice cream sandwiches. Choose from the day’s selection of fresh, soft, homemade cookies and several flavors of ice cream and watch as the staff perfectly merges the two. The sandwiches are huge, so if you’re looking for a light dessert, plan on sharing between two or three people. If you (like me) need a bigger sugar fix, it’s not hard to demolish a whole sandwich on your own. Bonus: This is British Columbia’s first certified organic bakery. The counter at Lee’s Donuts looks like any other donut shop. But don’t be fooled. A few times each hour, a warm, sticky batch of honey-glazed donuts comes fresh out of the oven smelling like heaven. Stop by the counter and ask when the next batch of honey-glazed is coming out fresh and then circle back to buy and eat one still warm. The experience may even win over the non-donut-lovers among us. Thick, soft scones with slightly crisp shells. 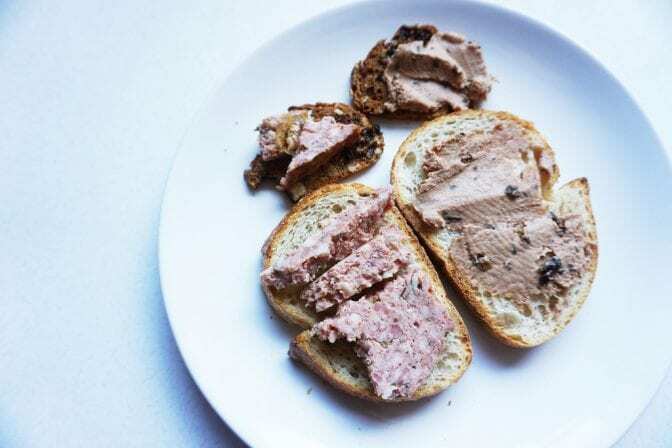 Moist sweet breads spread with icing. Savory breads ready to slice into and spread with butter or sandwich fixings. Whatever you try at Purebread, it’s sure to be a pleasure. You’ll find three locations in Vancouver itself and two up in Whistler if you head that way for a day trip or a weekend getaway. Each location is just as the good as the one before it. Back on Granville island, if cheese is your jam, you’re in luck: Benton Brothers specializes in small production cheeses from across the country (not to mention around the world). Tell them what you like (sharp cheeses? Mild cheeses? Cow cheese? Sheep cheese? Goat cheese?) and ask for their recommendations. The staff is incredibly knowledgeable. While the bistro itself didn’t wow me, the small attached shop, bursting with Canadian foodie treasures of all kinds—from chocolates to sauces to syrups—most certainly did. Try the bourbon maple syrup or a jar of Earnest ice cream. This German butcher opened shop on Granville Island in 2001—and has been delighting carnivores ever since. If you’re planning a picnic, grab some bread from A Bread Affair, cheese from the Benton Brothers, veggies from the surrounding market, and ready-to-eat meats from Oyama. My personal favorites were the pates, though I also loved buying a couple sausages and taking them home to make for breakfast the next morning. You can grab a jar of Earnest Ice Cream to go from several specialty grocers or you can visit one of their four Vancouver locations and have a cone. Flavors run from classic (like salted caramel - my personal favorite) to unusual (like London Fog or Matcha green tea). All are creamy and sweet and perfect for a sunny summer. Gigi Griffis is a world-traveling entrepreneur and writer with a special love for all things European food and adventure. She’s been traveling full-time in Europe since 2012 with her pint-sized pooch and oversized appetite. You can find her at viciousfoodie.com or gigigriffis.com.